We are very pleased to have in our workshop this violin made in 1807 by ‘Young William Forster’ from the respected Forster instrument making family in London. Four generations of Forsters were leading figures in London’s violin trade during the 19th century. (Young William Forster’s father ‘Old William Forster’ was an esteemed cello maker who made instruments for King George III). 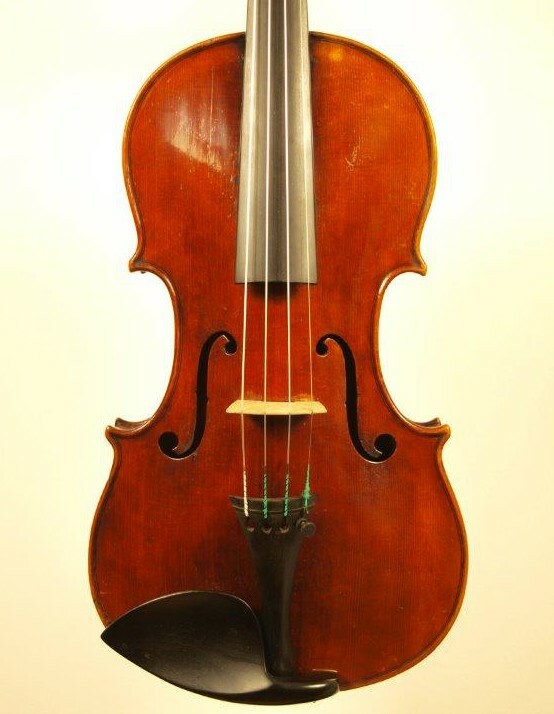 This violin is reminiscent of the famous Cremonese maker Hieronymus Amati and is a very good example of Young Forster’s work . It is a pretty instrument with an excellent sound of almost soloist quality. We have also discovered that it responds incredibly well to adjustment. With some micro adjustments of the bridge angle, post and tail piece, we have achieved significant variation in the violin’s tone. The violin is slightly undersized with the length of back being 352mm but the clever design of the rib depth and arching results in an impressively expansive and rich sound. The violin has a delicately cut scroll, a fine grain spruce front and a two piece back of well rippled maple. It has an unusual velvety appearance, covered in a glorious, slightly soft looking plum oil varnish. This instrument is in a good state of preservation. To arrange a trial please contact philip@philipbrownviolins.co.uk or 01635 35465.